It’s a snow day here, and I’ve been busy on a project. So this week is a quick, simple post about sugar and metal. If you ever study metal contents in sugary solutions (in this case, a juice mimic), you should not evaporate your contents. As seen in the picture above, our mix of sugar and metal caramelized after evaporating all of the solvent. As tasty as it looks, eating it might kill you. So I wouldn’t recommend that. Instead, the sugar and metal mix just made for an exciting mess to clean up. 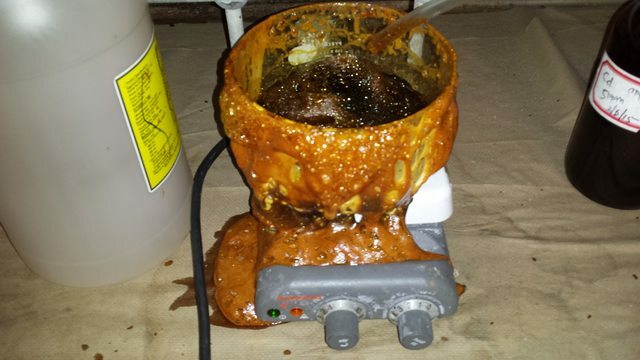 So remember kids, if you want to evaporate your solvents, beware of heat. Heating the material too long leads to caramelization of the sugars, and a big sticky mess. In the end, the cleanup produces more waste than the original solution.